Honey Bee Sting: Foodista's Best of Food Blogs Cookbook! 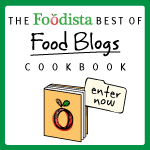 Foodista has put out a call for entries for the Foodista Best of Food Blogs Cookbook. For the next couple months, food bloggers can submit their photography, writings, and original recipes to Foodista.com. The public can view all submissions on the website and vote for their favorites. That feedback and editors at both Andrews McMeel Publishing and Foodista.com will determine 100 entries chosen for inclusion in "The Foodista Best of Food Blogs Cookbook." More info available here: http://www.foodista.com/blogbook. I'm telling everyone I know that has a food blog! You should too!